Relaxin’s diverse actions in rats. Those seven targets where effects of circulating relaxin have been demonstrated during pregnancy are indicated with solid lines. There is also evidence of action of relaxin in the skin, ovary, liver, heart, and lung. Relaxin’s actions in the nonreproductive targets occur in both male and female rats, and their physiological significance is not understood. Relaxin secretion from the primate corpus luteum Describes the sequential nature of steroid hormone priming of relaxin secretion from the primate corpus luteum and gonadotrophin influences from the pituitary and conceptus. Potential undocumented feedback mechanisms are indicated (?). 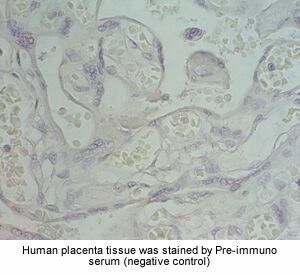 LH: luteinizing hormone; CG: chorionic gonadotrophin. 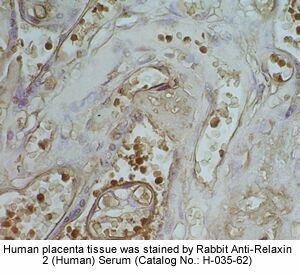 Intracellular mechanisms whereby relaxin and oxytocin regulate contractions of uterine myometrial cells. Effects of relaxin and oxytocin that are supported by experimental data in rat and/or human myometrial cells are indicated by solid arrows. Possible effects of relaxin that have not been demonstrated are shown with dashed arrows. AC, Adenylyl cyclase; Gs, stimulatory G protein; R-PKA, regulatory subunit of cAMP-dependent protein kinase; PKA, catalytic subunit of cAMP-dependent protein kinase A; CaM, calmodulin; Gq, G protein q; PLC, phospholipase Cß3; PIP2, phosphoinositol 4,5-bisphosphate; DAG, diacylglycerol; AKAP, A-kinase associated protein. Ion channels that control influx of calcium at the level of the plasma membrane are capacitated calcium entry (CCE) and voltage-operated (VOC). Diagram of actions of blood-borne relaxin or systemic hypertonicity on the circumventricular organs of the lamina terminalis to influence body fluid homeostasis. MnPO, Median preoptic nucleus. Structures of rat, mouse, pig and human relaxins. A, Covalent structure of rat relaxin. [Reproduced with permission from M. J. John et al. : Endocrinology 108:726?29, 1981 (37 ). ?The Endocrine Society.]. Residues that are identical in rat relaxin and rat insulin are circled. B, Amino acid sequences of B and A chains for the following forms of relaxin: rat 1 [Reproduced with permission from M. J. John et al. : Endocrinology 108:726?29, 1981 (37 ). ?The Endocrine Society. ]; mouse 1 [Reproduced with permission from B. A. Evans et al. : J Mol Endocrinol 10:15?3, 1993 (38 ). ? The Endocrine Society. ]; pig 1 [Reproduced with permission from C. Schwabe et al. : Biochem Biophys Res Commun 70:397?05, 1976 (39 ); C. Schwabe et al. : Biochem Biophys Res Commun 75:503?10, 1977 (40 ); R. James et al. : Nature 267:544?46, 1977 (41 )]; human 2 [Reproduced with permission from P. Hudson et al. : EMBO J 3:2333?339, 1984 (31 )]; human 1 [Reproduced with permission from P. Hudson et al: Nature 301:628?31, 1983 (30 )]; rat 3 [(Reproduced with permission from T. C. D. Burazin et al. : J Neurochem 82:1553?557, 2002 (42 )]; mouse 3 and human 3 [Reproduced with permission from R. A. D. Bathgate et al. : J Biol Chem 277:1148?157, 2002 (11 )]; and pig 3 [Reproduced with permission from H. Kizawa et al. : Regul Pept 113:79?4, 2003 (43 ); C. Liu et al. : J Biol Chem 278:50754?0764, 2003 (13 )]. Residues are numbered with respect to the N terminus of rat and mouse relaxin. Residues that are invariant or highly conserved in relaxin are boxed.